If you've ever shopped in Dallas and seen mirrored furniture on display, you may have wondered: is mirrored furniture in style? Or out of style? Back in the 90's, mirrored furniture was overused in interior design, so it went out of style for awhile. However, mirrored furniture started to come back steadily in the early 2000's. Most interior designers now believe that it's a trend that's here to stay. To some people, mirrored furniture has a classic look that will always bring a touch of glamour and elegance to a room. Others believe that these pieces work best when they're used with restraint. By following some basic guidelines, you should have no trouble finding the perfect place for these pieces in your home. This 3-part mirrored desk by Bungalow 5 commands quite the presence with its high shine and ample storage space. If you’re interested in purchasing Bungalow 5 products, please feel free to reach out to us. The earliest examples of mirrored furniture date back to the 18th century. At that time, mirrored woman’s dressing tables were especially popular. 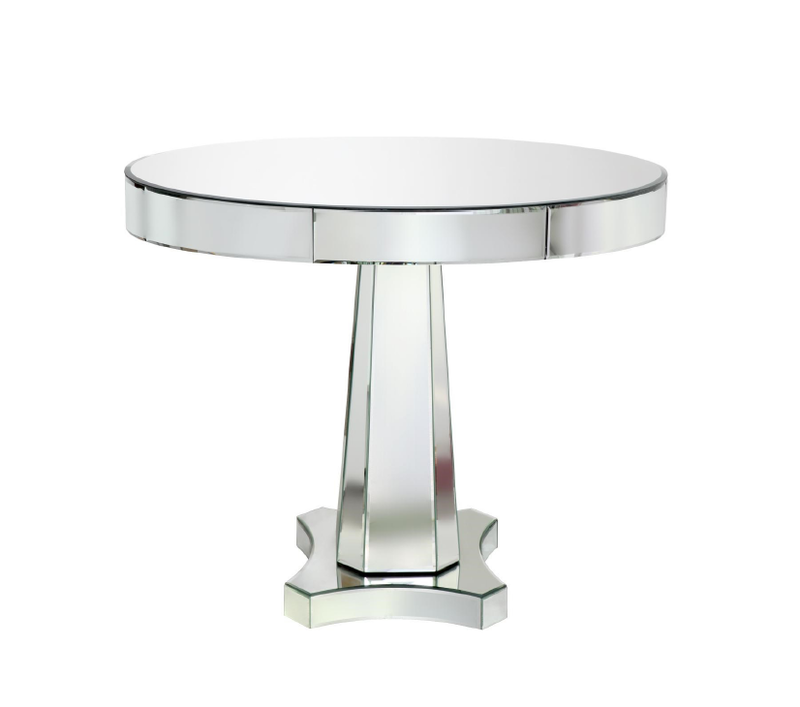 However, most of the new mirrored furnishings you find today are actually inspired by pieces from the Art Deco period in the 1920's and 30's. That's why when people see mirrored furniture, they might think of old Hollywood interiors. 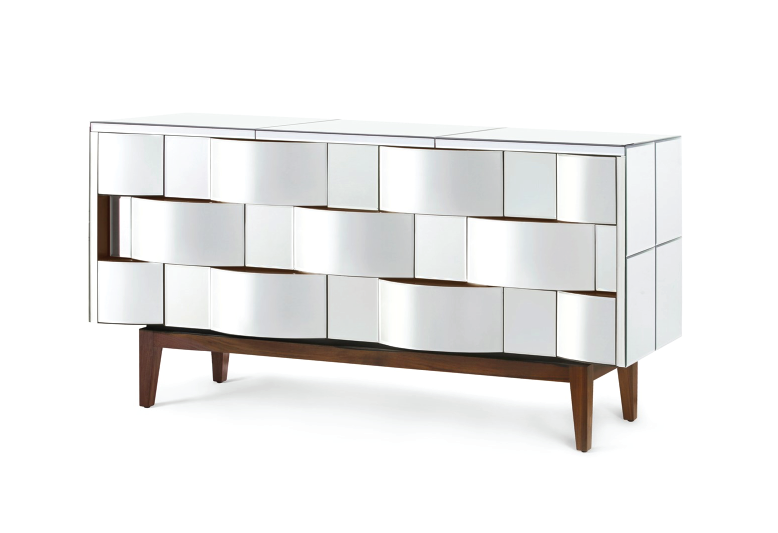 Mirrored furniture can feel both glamorous and retro at the same time, so it works best when mixed with other styles. One major benefit of introducing reflective surfaces into a room is that it gives the illusion of extra space. While a wooden armoire with dark staining feels visually "heavy," the same armoire with mirrored panels will actually "recede" by reflecting what is around it. Although mirrors can bounce light around a room, they also make a room feel cool instead of warm--much like metal furnishings. The high sheen of this furniture can serve as a bridge between classical and contemporary elements in a room. Bungalow 5 has also released this stunning 7-drawer storage piece. Its overall structure takes inspiration from Italian midcentury design, while the rippling wave pattern is a stylish addition. The downsides to owning mirrored furniture include their cost of repair. Fixing any damage made on mirrored furniture can be a challenge. Also, keep in mind that you'll need to wipe away fingerprints, dust, splashes, and stains regularly. While cleaning may be frequent, however, it is also much easier to clean than wood. For instance, a wet glass that would leave on ring on wood furniture wouldn’t do the same on mirrored furniture. Pictured above is the Cecilia center/dining table by Bungalow 5. It is made of wood with a mirrored surface. The best kind of mirrored furnishings for bedrooms include wardrobes, chests, side tables, and dressing tables. A bed with mirrored frames makes an especially dramatic, more contemporary statement. For your living rooms, consider having a mirrored coffee table, end tables or sideboard. Mirrored folding screens can also add a touch of style to a large room. Of course, you don't have to commit to a large statement piece. Chairs with a band of mirrored glass around the frame, or a small mirrored bedside table, can also add just a touch of sparkle. On the other hand, you'll want to avoid putting this kind of furniture in busy rooms that already have a lot going on. A good rule of thumb is to have no more than one or two pieces in the same room. Don't forget that mirrors can also be made with gray finishes to tone down their shine, while antique patinas give mirrors a unique "smoky" look. Unless you're after an antiqued patina, there's no need to track down real period pieces, however. Antique mirrored furniture was often cheaply made, since it's easier to glue on mirrors than staining or carving a wooden piece of furniture. We have the ability to help you find newer pieces that have this same, antiqued look. As you can see, mirrored furniture is surprisingly versatile. When placed with care, these captivating pieces can make the whole room feel larger, bridge the gap between classical and modern, or add a glitzy shine. If you want to make sure that you're bringing out the full potential of your mirrored furniture, here at Chambers Interiors we often use mirrored pieces in contemporary, transitional and traditional spaces. If you're starting from scratch, we can also help you locate a wide variety of mirrored pieces in the Dallas Design District that are perfect for your interior.